Selim Temo was born on 27th April 1972 in the village of Mêrîna in Êlih (Batman). He completed elementary school in the village and middle school in Batman. 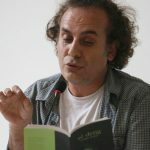 In 1992, he began his studies in the Ethnology Department in Ankara University at the same time as he started publishing his literary work. He received his master’s and PhD degrees in the Department of Turkish Literature, Bilkent University (with the thesis title, “Literatization of the Body in Cemal Süreya’s Poetry” in 2003 and with the dissertation title, “The Province in Turkish Poetry: 1859-1959” in 2009). In 2009, he became an assistant professor at Mardin Artuklu University and undertook the initiative of establishing the Department of Kurdish Language and Literature. However, due to the state’s refusal to grant Kurdish Language and Literature a departmental status, he resigned from his committee position. In 2011, he was a visiting professor in the Centre for Kurdish Studies at the University of Exeter, England. He worked as a columnist for Radikal newspaper between 2013 and 2014. His poetry and other literary works have been translated into German, Azeri, Flemish, French, English, Kurdish (Kurmanjî, Sorani, and Kirmanjkî), and Turkish. * After these last two translations were re-issued three times, the publisher began to publish older translations done by someone else.